Why don’t most Spiritual People understand that Light Energy can be harmful to People on Earth? After having worked with energy, consciousness and healing for more than 25 years, I still wonder why there aren’t more spiritual people who question when it’s good/bad to work with light energy. In many cases, light energy can be as harmful as the darkness that the very same spiritual people very often distance themselves from and/or are afraid of. However, there is no reason to fear neither the darkness nor the light. Instead, many spiritual people should update their personal consciousness and insight so that they can begin to understand the overall energy and consciousness from a modern earthly perspective where the Golden life force and creative energy dominate, and not continue to live their life based on what the big Spiritual masters said 50 or 100 years ago, where all human beings were born on soul level. Everything changes from day to day here in the earthly sphere, and the energy is constantly raised in frequency and has been for decades, so the knowledge that the experts shared 50 years ago is in many cases outdated today, which is particularly evident within the fields of technology, healing, science and research. So when modern healers are fully convinced that it is okay to heal with light energy on a very illuminated person, they often make a big mistake. Here on Earth there is a need to balance the opposite energies of the world, and therefore it is not possible to amplify light with light as it in many cases illuminates (and dissolves) the dark and the dense energy that most people have – and need – in their physical body. If the body is illuminated on the energy level, it loses its physical power and strength, which is very important for the body if it should last for many years. It is perfectly okay to use light energy to heal (and illuminate) a person with a very dense and darkened energy in the body, so there can be balance. It’s also okay to ground and densify (someone might call it darken) a very light person with an illuminated body energy who cannot find rest in their physical body. This will create balance in the illuminated body. But it DOESN’T create balance to work with light energy in an illuminated body or to ground and amplify the physical energy in a very dense and heavy body. This is equivalent to continuing to fill additional fuel on a tank that is already full. On the other hand, it is perfectly okay to heal with love, since love is an all-consuming energy that contains both light and darkness as well as all existing contradictions in itself. Therefore, I am the biggest fan of working with balance and love energy when I heal, because then it is not me who decides whether the client is given illuminated non-earthly energy, or dark, dense and earthly energy into their physical body and consciousness. Instead, it is the client’s own energy system that knows what is best for them. This is an excerpt from Anni Sennov’s newsletter #64, October 2017. I wrote “Golden Age, Golden Earth” because I believe that essential information is missing in many spiritual books on our planet’s very important role in the overall cosmic development plan. Apparently, most spiritual people tend to think that Planet Earth needs help to raise its energy level, but actually it is not the Earth that needs help. It is the people living here who need help, and it’s not just the most primitive people who are in urgent need of help. 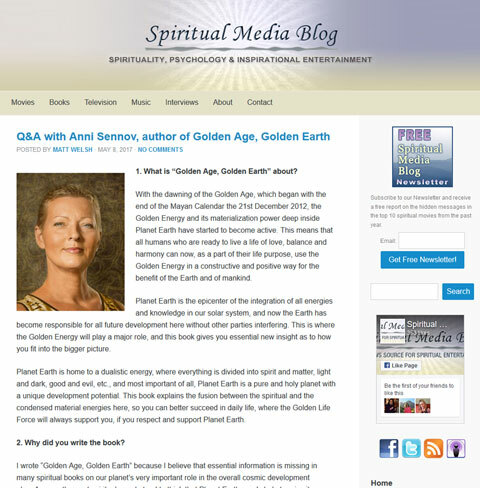 Anni Sennov talks about a shift in energies and the next step in our planet’s development and expansion, a life force energy that invites us to do everything right, inside out. 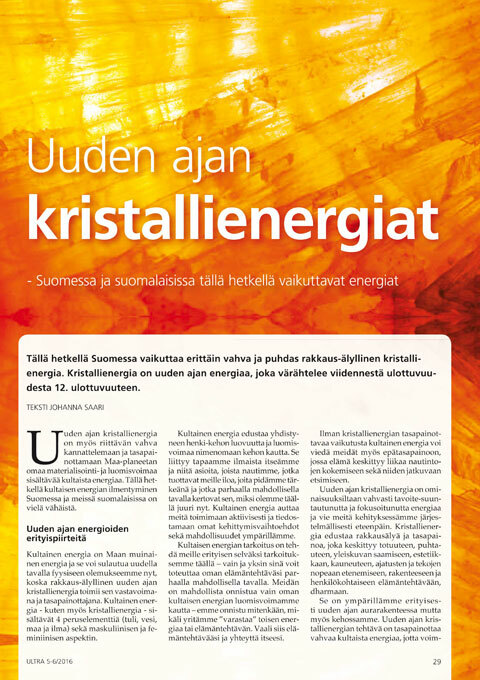 There is a very strong and pure love-intelligent Crystal energy present in Finland but the Earth’s Golden materialization and creative power is almost non-existing in the Finnish society. Not many Finnish people feel happy deep inside. Life sometimes feels like a burden and the body is not happy at all. That is why many Finnish people don’t take fully care of their body and they don’t listen to it the way they should. The body doesn’t get the respect it needs and things start to go very slowly. For millions of years Planet Earth has been the epicentre of the integration of all energies and knowledge coming from the other planets in our solar system, which is why it has been a challenge for most people to live here. Planet Earth is a place where every one of us has come from different parts of the Cosmos to experience, learn and play with the countless possibilities that are found here. Some have also come here to challenge themselves, because Planet Earth is the only place in the Cosmos that consists of both material and spiritual energies. So here you can explore all variations of energy, even though some spiritual people believe that Earth is a lowfrequency place consisting of non-spiritual beings, living side by side with nature and a countless number of innocent animals. The Anti-Power in our daily lives include, among other things, the many negative energies that swirl around in the air all over the Earth in connection with war, terrorism and people on the run. These giant overall energy imbalances between large populations, political and religious beliefs, etc. may never be solved by a smaller group of helpful people with good intentions who choose to send lots of healing and love to the crisis areas. The unconditional love that is sent to everyone in the crisis areas – in the hopes that their situation will soon improve – is also inadvertently sent to the bad guys, who rarely use this energy in the intended way. The more love you send in the bad guy’s direction, the more they believe that God is with them in all that they do. So try just for a moment to put yourself in fanatical peoples’ place before you begin to shower them with unconditional love energy. They may not know where this energy is coming from, and therefore conclude that it is the highest power that is honoring them in relation to the things that they do. For example, not long ago, local people who lived in totally ‘untouched’ areas in Africa, the Amazon and Papua New Guinea thought that traveling scientists, who were quite fair skinned, were spirits from another world. The cultural gap was simply too great, and it still is in many places on Earth where people have different perspectives on freedom, compassion and success. Not all people on Earth think alike and often they come from very different places in our solar system and in Cosmos, giving them a different perspective on life. This is why integration is needed on all levels on Planet Earth to help people, communities and countries, etc., to increase their awareness in a new direction. It may happen when refugees are integrated into a new society under the conditions that apply to the new country, and where the host country shows an openness and willingness to make room for people who have a different view of life, without compromising its own values. Here the refugees will integrate the new country’s values into their life, unless they are brought together in ghettos, where their birth cultures instead are converted into subcultures in the new country. Integration is also necessary to learn to understand how people in other countries, cultures, environments and religions think, so that future disasters and crises can be avoided. Although we get daily updates about the situation in the world through countless media, we cannot always be sure who the real villains and true victims are in different contexts. This is because espionage, counter-espionage, hacking, political manipulation, conspiracy theories, rumors and corruption are still used to a degree that far surpasses the former Cold War between the US and Russia. Therefore, I would not recommend that you or anyone else begin to play God in the living room by sending love to everyone involved in a crisis, when you do not know how the energy is likely to be managed by its receivers. People must often be very clean in their consciousness to be able to manage the high-frequency energy of love in a fair and balanced way. However, if you choose to step out and get involved in places that need an energy boost, the situation is somewhat different. Then you have the option to evaluate the situation with your own eyes, on site, whether it is the people, the culture or something else that is in need of the energy boost. So, in all places and situations in which you choose to involve yourself, not just with your brain and thoughts or your consciousness, but with your whole body and mind, you can operate as a physically active player in the ‘fight’ for a better world. In such a circumstance you are allowed to balance the energies around you and do everything you can to change the energy in and around the things you are passionate about, because then you are a part of the energy and the situation yourself. You cannot allow yourself to pass other people’s houses and send energy to them, without them first requesting it. Neither you nor anyone else has the right to interfere in other people’s lives unless there is a risk of negative consequences for them or for others. However, you can always choose to fight for what you believe in and are passionate about, be it children, animals and/or abused persons, etc., if you think you can contribute in a positive way. So step out and participate in situations and places where you think that you can make a positive difference or support people and organizations who fight for what matters to you and that you believe in. 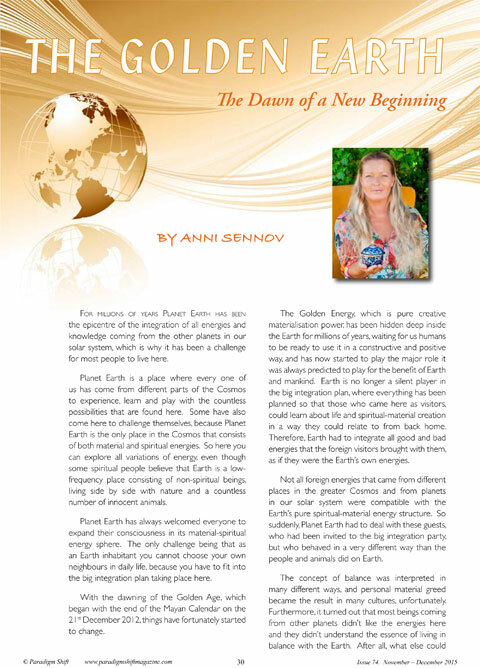 This is an excerpt from Anni Sennov’s newsletter #56, December 2015. 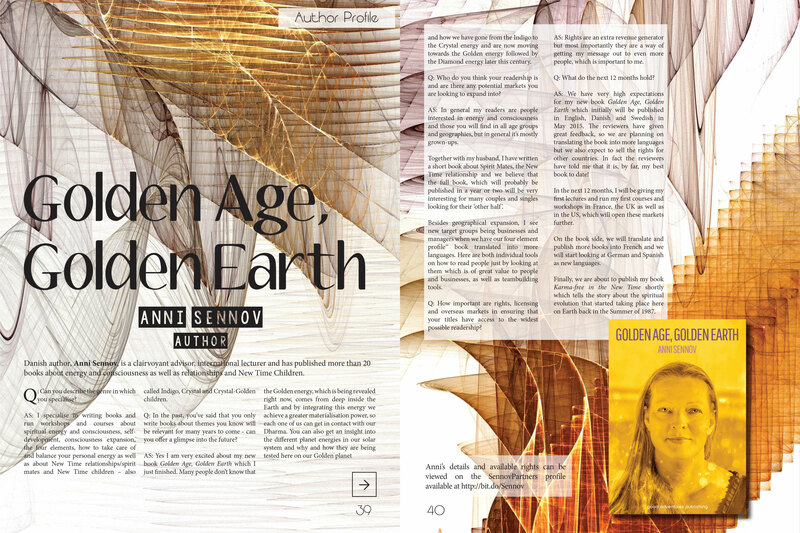 Anni Sennov presented April 2015 in IPR Rights Magazine at London Book Fair. Quite a lot of people are not aware of the fact that the Body Crystallization Process starts all by itself for all conscious grownups. This happens even if they have not had an AuraTransformation™. The reason being that the spirit is trying to find its way into the most physical and dense part of us to become a part of our personal energy expression. In other words one can say that the spirit is substituting the physical ego in the body, which can be quite a long process. AuraTransformation™ is a key to opening up for the crystallization of the aura, which often activates our Body Crystallization Process, if this has not already begun by itself before the AuraTransformation™ was done. The Body Crystallization is a longer and more dense thorough process than the Aura Crystallization which is achieved through an AuraTransformation™. The Body Crystallization has a major impact on our personal expression and appearance. Crystallization of our personal network is the last step in each person’s overall Crystallization Process to become a Crystal Human. This is why there in these times is a far greater focus from many people on networking with other people than ever before, which I know many of my spiritual human fellows are appreciating very much. You can read more about the Crystallization process in my books: The Crystal Human and the Crystallization Process Part I and The Crystal Human and the Crystallization Process Part II. 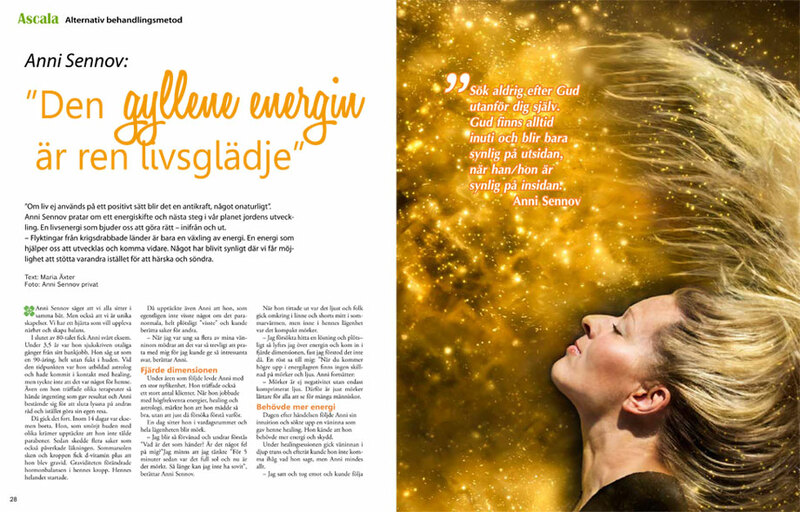 You can read about the Crystallization Process in Danish in Krystalmennesket & Krystalliseringprocessen and in Swedish in Kristallmänniskan och Kristalliseringsprocessen. Anni Sennov presented May 2014 in IPR Rights Magazine at BEA BookExpo America 2014 in New York. Balance on All Levels with the Crystal and Indigo Energies is an expanded and updated version of Anni Sennov’s book Crystal Children, Indigo Children and Adults of the Future. The book gives you good all-round insight into what it means to be a New Time Indigo and Crystal child/person and how the Indigo and Crystal energies, now and in the future, will affect everyone’s lives, life values and day to day existence on Planet Earth. The Crystal Human and the Crystallization Process Part I and The Crystal Human and the Crystallization Process Part II are two down-to-earth guides that help you understand and deal with the spirit’s journey into your body and your everyday life, as well as the consciousness-wise lift that the New Time energy automatically entails for us as humans. The books describe various physical and spiritual aspects in relation to the Crystallization Process and are supported by several personal cases that were contributed by individuals who have personally experienced the spirit’s journey into their body. Read the books and be at the cutting edge of the Crystal Energy’s entry to this Earth. AuraTransformation creates a new aura in those born with the old aura structure. It was developed by Danish clairvoyant Anni Sennov, after several years of severe asthmatic eczema resulted in her being hospitalised in 1992. With conventional and alternative treatments both failing to cure her, that summer Anni decided to take full responsibility for her own health. Within two weeks of making this decision, her disease was cured, and she became pregnant. When it comes to preventing stress, focusing on healthy eating habits, exercise and personal well-being are essential. Of course it may be a blessing also to cut back on the work hours, if you need extra time with your family. Many people, never the less, thrive on working long hours and slave away if they feel they have found their right place in the world, where they more or less and at the right pace feel they can fulfil themselves. Maybe these people have an inner clear picture of their dream job and have had it even when growing up. They had a vision of the direction, in which they wanted to proceed. Therefore, they are now driven by realizing their dreams. This is a situation which unfortunately is granted far too few people. Choosing to throw themselves in demanding and enormous job situations and never feeling the slightest bit stressed, despite high-paced work and seemingly enormous assignments, is usually the result of the persons in question having looked inward previously in their lives. Looking inward to find the answer to the question what they basically wanted to do with their lives. Given all, stress is solely the outcome of human beings doing things involuntarily. They may accept state of things in their lives, things they do not thrive by. They may spend their time on things they are not interested in. Things they may not even like or things they are not able to cope with. As a matter of fact people with stress are rarely conscious about the reason for their stress reaction. Their focus is not the right focus, neither when they are in a process of exceeding their limitations nor when they let factors from outside release the stress. They are not able to set limitations in their lives or they are controlled by finances, prestige, influences and/or pressure from outside. Whether the reason for stress is triggered by a hidden wish of obtaining something or the by fear of losing something is irrelevant as such, as the final result is the same – viz. stress. ‘Positive stress’ is simply a person objecting to any existing pressure. Hence the person may miss out on a possible promotion or the option of a breakthrough in their field of passion. Therefore, the person does not benefit from the effort they have done previously in their specific job. If the person chooses, however, to withstand pressure there are definitely advantages to see in the long run. At the other end of the stress-scale lures a risk getting fired from the job, by the partner or by others who are close to the person. This is a reaction from the counterparts if the person backs out and does not perform satisfactorily on the job, in their relationship or within the family. Stress is not only a factor relating to the job. unstable transport opportunities to and from job, day care facilities and home changes in private sphere – i.e. moving, child birth, children starting day care or school, divorce etc. have been able to mobilise the energy to handle the up-coming change and/or disturbance. Your mind stops working, however, when things keep taking our unawares, when they remain dysfunctional and when we are unable to change things significantly. If the disturbance is only short-lived, most people are very good at restoring themselves to health, perhaps by getting a little extra rest, going on vacation or doing something good for themselves. This is their consolation in their busy and modern daily lives. On the other hand, the stress and the strain you put on your entire body may require a few days in bed, as the body reacts before the mind. This kind of stress can be cured with healthy eating and healthy living. Once you have experienced stress your stress level is never the same again. Quite simply, your upper management bar has been lowered once and for all. This means it is often difficult if not impossible to return to the same job or job situation again. A consequence of this kind of stress forces you to see your job- and health situations in a different light. Today’s human beings often identify themselves by the job they do. Therefore, the person is forced to consider thoroughly what they want to do with their daily life and life in general. All of a sudden a clear picture shows that personal development is the way to go. Through personal development you can find out what you really want to do with your life and find your personal limitations. I often get emails from my readers, asking me why I have not written about ‘this’ and ‘that’ in my books, and why I have not gone more in depth with a certain angle on the concept of ‘energy’. The topics, I get asked about, are often quite specific and are important to the respective reader of course, but often it is not important to other people, which is why it is not relevant for all readers to familiarize themselves with the topic. When I write books, I always have to first make a general assessment of how much I should mention specific subjects, and how much I’ll go in depth with the respective subjects. For although there are many spiritually oriented people on this Earth, they do not have the same approach to spirituality all together, so for each book I have to be aware of whom I address my writing to. Are people interested in spiritual science, do they wish to make contact with other planets and alien galaxies, are they used to communicate with angels, do they have a holistic outlook, or is it people who just want to know why they react as they do after having become acquainted with New Time Energy via an AuraTransformation™? The angles of looking at energy from are many and at the same time very nuanced. In my world, I try whenever possible to give ‘the big picture’ with its many aspects in a balanced way, so as many different types of people as possible can benefit from it in their own way at the same time. My energy message is addressed not only to one group or one particular type of people. It is aimed at all possible types of people who want to integrate spirituality into their physical bodies and daily lives in their own individual way. I go out to the world in my own individual way, which I feel comfortable with and which matches my personal expression. If my way of expressing my self does not match the way in which the recipients feel good about receiving energy messages, because I am either too direct, practical or realistic in a little too down to earth-like way, then fortunately enough there are so many trained Aura Mediators in several countries with their own individual expression and background, that it is certainly possible now to find someone who can express themselves in a way that matches any individual. It is not possible for me to take into account all the cultural, social and individual factors that exist out and about in the individual auratransformed readers daily life, so I naturally can not satisfy everyone’s needs to get around the various energy-related issues in a comprehensive way, but I do try my best. What I can do, if my readers have ‘big’ questions in their lives that they themselves can not cope with and which they can not get help and answers to from other therapists, is that I can offer individual sessions on Skype with the auratransformed persons even though my calendar is often fully booked. Also there is now more New Time-related reading material than previous of which I have written quite a lot. This is the reason why many people become far more self-reliant and aware of where they are in their own personal crystallization process. At the same time beautiful things happens, when many New Time people are fully crystallized in their entire energy system, since they become so well functioning that they have no need for further upgrading of their energy system, which allows me to help more new people on the way. The fully crystallized people can now go out and create and live their lives in their own individual way as they are supposed to, which is the whole purpose of the crystallisation process. I do not take clients for AuraTransformation™ and Balancing sessions, unless special circumstances exist, since there are now educated so many talented Aura Mediators around the world. My speciality is my clairvoyance, which is not the usual soul-based clairvoyance in which the client will be told whether he will get married soon, have four children and a good job. Instead I can see and talk about the consciousness reasons for why things happen and help my clients to gain clarity about their life situation and understand their role in their own lives, which might sound simple, but I assure you that it is not. My clients are generally very conscious people, and often very active people, who know that there is an underlying purpose for their lives and who feel frustrated that they can not just get on with living their lives ‘the right way’ straight away. These are people who need extraordinary insight that not everyone needs, and this insight brings peace to their system. In short you can say that I advise conscious clients about energy situations that are affecting their personal balance, because the energies unfortunately are not always self explainable. 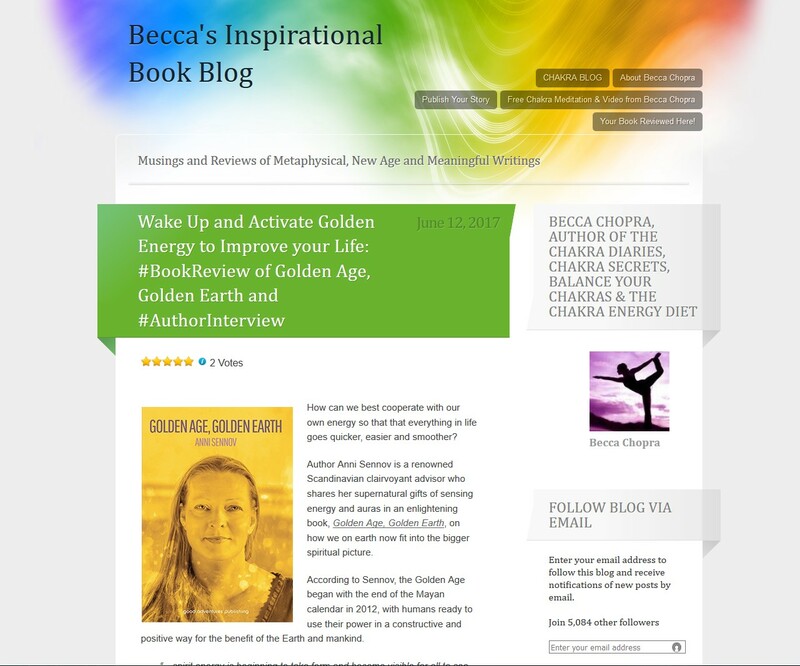 This was a little info about how I perceive and act my role as an author and mentor on how to live with the New Time Energy as a fully integrated part of our human physical life. An AuraTransformation™ is a permanent expansion of your consciousness. 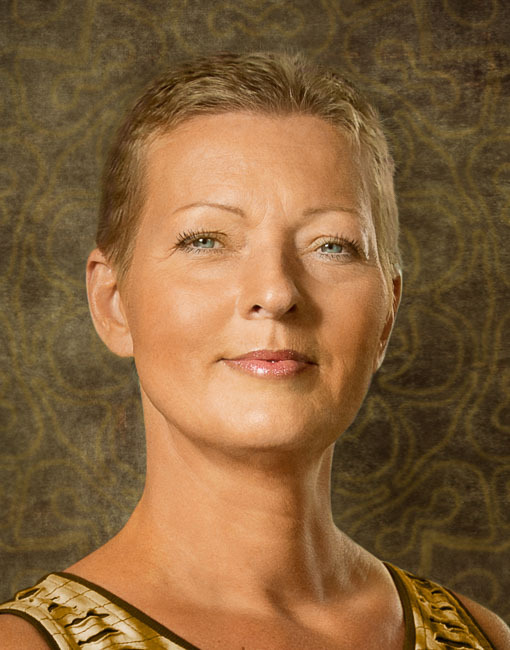 Danish clairvoyant Anni Sennov invented the method in 1996 and since its introduction it has spread widely, primarily throughout Scandinavia. Below is Anni Sennov’s personal story, which led to the AuraTransformation method. The story is taken from her book Balance on All Levels with the Crystal and Indigo Energies published by Good Adventures Publishing – www.good-adventures.com. When I was very young, I had no idea that there was anything called the alternative world. I only knew about horoscopes in magazines, which I was very interested in – imagine being able to predict the future! When I was 17 years old, I began to read about astrology, which became my all-consuming hobby and at the age of 22 I became acquainted with healing, meditation, planet journeys and regression therapy and my personal concept of the world really began to break down. So I decided to put aside this newly acquired knowledge of alternative lifestyles for the next few years. When I was 27 I became seriously ill for three and a half years with very severe eczema. During this period I was given a whole range of treatments by members of the established medical system but with no tangible results. I also tried everything in the world of alternative therapies but nothing helped much for this very painful condition. One hot summer’s day I made up my mind that I would be healthy no matter what and that the responsibility for being well in the future had to be my own and that I would stop constantly putting my life in the hands of different therapists. It was then that a ‘miracle’ took place. In under two weeks my eczema was gone and I was also pregnant. These two things seemed to me to have arisen from my conscious choice to take responsibility for my own life. However I was not yet aware that, unlike most other people, I had no energy bodies in my aura. Several years passed where I limited myself to horoscope reading and healing, as well as looking after my small son, before receiving the message that became AuraTransformation™ as the solution to my previous skin problem suddenly came through. It was at this point that things really started to take off in my healing practice. This provoked a great deal of resistance from the outside world. The people around me and a number of alternative practitioners clearly felt that I had a screw loose. How on earth was I able to pick up energy states which were so far beyond any previous channelled spiritual knowledge? This can be explained by the fact that other people’s auras were still intact whereas mine was not, due to the fact of my illness. Strangely enough this was not picked up by any of the psychics I visited during this period. They were unable to relate to energy states in me that were far beyond their own framework of understanding, something which still prevails in some spiritual circles to this day, although fortunately the understanding of energy is far more advanced these days. There is no doubt that I must have seemed to be extremely provocative to many of my alternative therapy colleagues when I seriously began to work on spreading the concept of AuraTransformation™. Today, however, there are many trained Aura Mediators, particularly in Scandinavia, who, fortunately, are all able to speak about the concept in a more moderate way than I did when I made my breakthrough in 1996. My own AuraTransformation™ came about with the help of a friend who was a healer and able to channel very powerful energies. Before the healing, I had received some clear signals that I needed to integrate stronger protection around my body and that it should happen quickly because my aura was ’leaking’ energy into my surroundings. Of course I had no idea that it was an AuraTransformation™ that was about to take place. My friend was almost in a trance during the healing but fortunately, because of my psychic abilities, I was able to keep myself oriented during the procedure, in which my spiritual consciousness became fully connected to my body. This method, quickly seized upon by the majority of my clients over a short period of time, then became the basis for bringing the New Time energy to many people. Don’t search for God outside yourself. God is always on the inside and can only be visible on the outside when also visible on the inside. Rather be yourself in the ‘original version’ than being a bad copy of others. Everyone can only succeed with their own Dharma. People are here on Earth to improve their own energy. It is not the Earth’s energy and the Earth’s force that need to be improved. By making yourself one with nature, you give yourself room so that the spirit can penetrate completely into your body, which is what body crystallization is all about. The more balanced and grounded you are in your body energy, the easier it is for you to manifest and realize your ideas and visions in life. It is not the New Time energy that changes people’s lives. The New Time energy allows people to see more clearly which makes it easier for them to change their lives if needed. Inner balance is not always visible to others, because there is no pre-determined formula for how the balance should look on the outside. Do not use your time to fight the darkness. It is just dense light energy. It is evil that should be fought. It’s a good but difficult balance to love unconditionally while at the same time being able to set personal boundaries in your own life. No children are so divine that they do not need responsible parenting and be taught proper manners. Every human holds the truth within themselves. It is only a question of how deep they are willing to dig to find the answers. Many people do not really want honest answers to their questions. Instead, they want their personal wishes fulfilled, which unfortunately does not always represent the truth. All roads lead to Heaven for the divine, including the roads with no clear signage. The right decisions immediately take you to the closest highway, where you can maintain a steady speed and thereby quickly reach your goals. Half decisions, however, lead you to windy mountain roads and boring country roads. You may see many things along the way, but it will take you longer to reach your goals.